Wintersday is excellent. I'm having a blast and I hope you are too. 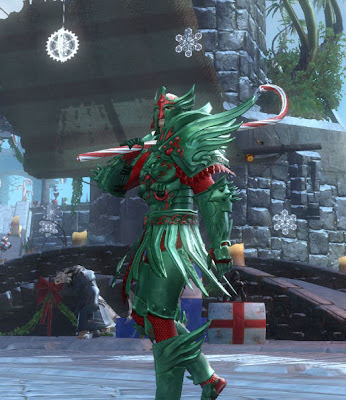 Like our own Christmas, the festivities in Tyria revolve around the excellent gifts, which, although free, tend to be stuffed with unwanted socks, jumpers and hats. More socks, jumpers and hats, in fact, than the entire population of Tyria could ever want or need. So how to go about gathering them fast? Well fright01 started a thread about just that on the boards. I'm hoping the forum becomes a breeding ground for great topics like this. It's a good guide to what users want to read more about! 5. Snowball arena (1 per loss - if you get a losing streak you can come away with barely any for your time). If you're aiming for a skin - like the beautiful candy cane hammer or the princess wand then don't forget that you can just buy these direct from the trading post. You can also buy the socks or hats or jumpers directly. Keep an eye on which price is cheaper. What do you guys think? How are you farming the presents? Don't forget to join our forum to talk about these kinds of topics in more detail! Dynamic events in the straits of devastation is one way of doing it, you can be anyway where in Tyria and get the chance of a gift, the 4th instance of the tix event seems to have mobs that drop from the start, if you're 80 you can get dyes, presents, the usual stuff. You ned a group though since those Skritt hit hard.